After my weekend away at Blackpool the previous November, I was thinking of doing a repeat performance with my mate Mark, who got us up to Blackpool on Virgin Trains. But unfortunately he was out of the country for this weekend. Then I saw that the Southend United Supporters' Trust were taking a coach up to Blackpool on the Friday and staying overnight in Blackpool, before going onto Morecambe on the Saturday. It was tempting, but due to going to Middlesbrough on the Tuesday before the game, I decided on the train. A bit more expensive than the coach, but after the Accrington Stanley debacle, I much preferred the train. Plus the coaches that were leaving on the Saturday were departing from Southend at seven in the morning, and going by train meant I didn't have to leave until just before ten. No contest. The only problem for me, was once I arrived at Lancaster, I would have to get a taxi to Morecambe's ground as the timing of the trains from Lancaster to Morecambe meant a half hour wait at Lancaster and then a twenty minute walk to the ground. At Euston as I waited for my train, the 11.30am to Glasgow Central to be prepared, I saw all sorts of football fans passing through the station, including Arsenal, Sunderland, Blackburn, Millwall and Tranmere. The train left on time, but they only let you on less than ten minutes before departure, so people were still trying to find their seats as the train was pulling away out of London. It was non-stop to Warrington, where some Wigan fans got on, going to see them play away at Man City. After one more stop at Preston we arrived at Lancaster shortly before 2 o'clock. 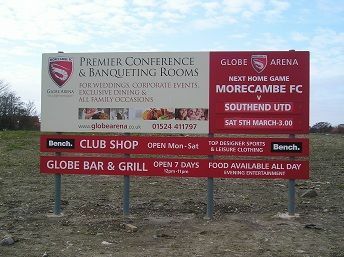 It was then into a taxi, with a driver who in the twenty minute journey gave me a brief history of Morecambe and told me why the Globe Arena was such a waste of money. Apparently Christie Park, named after the club's benefactor, Mr Christie, was meant to be left for the people of Morecambe's enjoyment and if football ever stopped being played there, it was to be given to the young people of the town for leisure activities. But what happened, he told me was that the owners sold it to Sainsbury's for £16 million, in spite of his wishes. And now all the people of Morecambe have got is an identikit ground built in a residential area which is not at all welcome. The journey took about twenty minutes in the traffic, as although the ground is less than a mile away from Lancaster station as the crow flies, you have to go across the river Lune and round the town to get to it. The taxi driver was right. It was just houses surrounding the ground. You can't see the sea and the railway station is a good twenty minute walk away. The actual area in front of the stadium still looks a little like a building site with mud and stones, where grass should be. I then go to find a seat in the main stand and sit next to Peter and his mate. The main thing I notice is that there's plenty of leg room, which is nice. The actual arena (sounds funny - "stadium" seems better to me) is exactly the same set up as at Christie Park, with a big main stand with seats, and two covered terraces behind each goal, and then a thin uncovered terrace opposite the main stand. You would have thought that they would have put a roof on this terrace in this day and age. But maybe the cash ran out? I notice the Morecambe mascot, Christie the Cat, who from a distance looks a bit like Father Christmas, as he's mainly red. I don't know why they don't have a shrimp, but perhaps we got in first with Sammy The Shrimp. Don't forget it's The Shrimps versus the Shrimpers today! There's also a troupe of cheerleaders dressed in red, standing by the tunnel waiting for the teams to come out. Appropriately for Morecambe they play Morecambe and Wise's "Bring Me Sunshine" and during the song the clouds open up to let the sun shine through! All of a sudden many fans around me stand up and start moving to the side. They've opened up the away fan's terrace after all! So around two hundred fans end up standing, with another hundred or so staying in the seats. The reggae tune, "The Motivator" is played and then the teams come out. The first half sees Morecambe dominate as you would expect, but Southend don't look their usual selves with just the occasional counter attack. It's hardly surprising that Morecambe score after nearly half an hour of almost non-stop pressure. It was by McCready, who headed in a corner from Hurst. 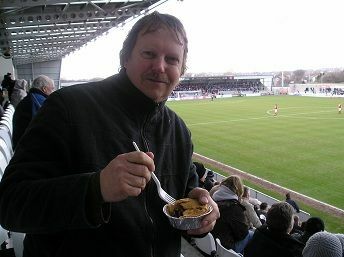 I then go out to the kiosk just before half time to get a cup of tea and buy one of Morecambe's famous pies. Sadly they've run out of pies, but just as I am leaving, a fresh batch arrive and I get one for just £2.40. They truly are delicious and tasty. At half time I chat to Sandra, Alf, Wino and Warren, before ringing up the taxi firm to book my taxi back to Lancaster at the end. I try three different Morecambe taxi firms, but no luck, so I ring the Lancaster taxi firm that bought me and get some joy. In the second half Southend are more in it and attack more. It is no surprise when Grant was brought down in the penalty area by Hurst, though he only gets a booking. Barry Corr places it neatly on the right and the game is on. Only it doesn't last long as Drummond headed in a pass from Wilson to give Morecambe the lead again. Southend keep pressuring Morecambe, but I feel that they have left it too late, and so the score remains at 2-1. The attendance of 1,917 is announced to laughter from the Southend fans. I reckon there's 300+ Southend fans who have made the journey including a couple of Scottish Shrimpers behind me, plus the Yorkshire and Manchester sections. Shortly before the end I leave, following a group of five Southend fans who get into a taxi before me. Mine soon arrives and the woman taxi driver takes me back to the station in around twenty minutes, so I have ten minutes to spare before my train arrives. The Southend fans get out of their taxi just in front of me and we chat a little. Surprisingly it's cheaper for me to go back 1st class than it was coming up 2nd class. The only catch is that I have to go back via Manchester to do this as, the more direct trains are full. I don't mind as I'm guaranteed a seat and get free tea or coffee and biscuits on the Virgin Train from Manchester Piccadilly, There's just one problem. As we are leaving Wilmslow, south of Manchester, someone pulls the communication cord, or in modern day railway language, "the passenger alarm". So we are stuck for about fifteen minutes whilst train staff run up and down the corridor. We do get going, but leave Crewe around fifteen minutes late. The guard says we should make back up the time, but we don't as we have to go slow near Milton Keynes, where there is engineering work. We finally get into Euston just after quarter to ten, so it's touch and go whether I will be able to catch the 10.10 train from Fenchurch Street. If the train had been on time, I would have easily made the 10 o'clock train. So as I have to wait at least five minutes for a tube at Euston, I realise that I'm not going to make it. In the end I arrive at Tower Hill just after 10.10, so it's another half hour wait until the next train. I finally arrive back at Leigh-on-Sea at 11.30. Sign hiding the building site! Me eating a Morecambe pie! All text, photographs and information on the Doing the 92 Plus website are copyright and may not be copied or used by individuals, websites or publications without written permission from the webmaster, Mark Chatterton. 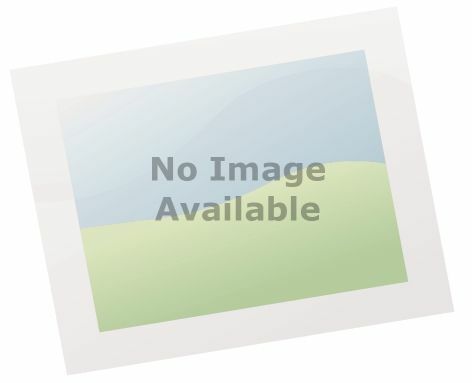 Any infringement of copyright will be vigorously defended by legal action.